My region was blessed with a very mild winter. We were due for some relief after several horrible years. Anyway, the result is that Spring is coming a month early, from the looks of it. The trees are already sending out leaves—they are in that stage when everything looks a little hazy because of the new shoots. The bulbs are blooming too. 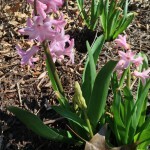 I love hyacinths, and they are poking up everywhere now. My own winter was interesting, and brought some changes that I will be revealing in the next few months. My next book, The Wicked Duke, went through production and it is ready to go for its May 31 release. I really like this book, and the hero surprised me in many ways as he emerged from his secondary character status to take the lead. I think, by the time the book ended, that he surprised himself too. Please take a look at the excerpt on the book’s page.